Permanent resident. A common species during the Minnesota Breeding Bird Atlas (MNBBA). A species primarily of the Eastern Deciduous Forest region, the Red-bellied Woodpecker’s breeding range extends from the Central Plains east to the Atlantic coast. Highest breeding densities are found in the southeastern states, especially along the Gulf coast (Figure 1). Although the species is considered a permanent resident throughout most of its breeding range, birds on the northern periphery of the range may move south during harsh winters and in response to food availability. Feeds on insects, mast, fruit, seeds, and sap. Food secured by hawking insects, by gleaning foliage, and by probing and excavating bark surfaces. Primary cavity nester in snags or dead limbs in live trees. Breeding distribution and relative abundance of the Red-bellied Woodpecker in North America based on the federal Breeding Bird Survey from 2011 to 2015 (Sauer et al. 2017). Minnesota lies on the northern periphery of the Red-bellied Woodpecker’s breeding range. Its northward range expansion throughout the United States has been documented for many years, including by many breeding bird atlases. In Pennsylvania, for example, the species was confirmed nesting in twice as many blocks during their second atlas (2004–2009) than during their first atlas (1983–1989); many of the new records were in the northern half of the state (Wilson et al. 2012). In Ontario, the probability of observing Red-bellied Woodpeckers increased 250% from the first (1981-1985) to the second atlas (2001-2005), and its range expanded north 112 km, and east 61 km (Cadman et al. 2007). The Red-bellied Woodpecker’s history in Minnesota is another excellent study of the species northward expansion. Although not always reliable, Hatch’s 1892 publication Notes on the Birds of Minnesota is considered the first complete annotation of the state’s avifauna. Red-bellied Woodpeckers were not among the 304 birds he described. The first confirmed record for the state came one year after his publication, when a male was shot in Houston County in 1893. The collector reported that he had also seen a pair “several years previously” (Roberts 1932). Roberts first observed the bird in June of 1898, again in Houston County near the town of La Crescent. Following the Mississippi River valley north, Red-bellied Woodpeckers were found in Goodhue County by 1900 and in Minneapolis by 1908. At the same time the species began spreading westward, evidenced by a 1907–1908 winter record in Rochester and an observation in the fall of 1908 in Steele County. Nesting was first confirmed in the state in the spring of 1903 when a nesting pair was found in Red Wing. No doubt, as Roberts noted, the species was probably breeding farther south in the state for many years prior to this. The first nest in the Twin Cities was found in Hennepin County in 1926. When Roberts prepared his 1932 treatise on Minnesota birds, Red-bellied Woodpeckers had become a common resident as far north as Red Wing with a few pairs established in the Twin Cities. The metropolitan area was, however, the northern limit of its range. He predicted, though, that it would be found farther north and west in coming years. Indeed, in 1975 Green and Janssen’s updated account reported that Red-bellied Woodpeckers, although still restricted largely to the southeastern corner of the state, were now a permanent breeding resident as far north as Stearns County. During the nonbreeding season birds were regularly reported as far north as Crow Wing County and as far west as the Des Moines River valley. Several years later, Janssen (1987) reported the species’ range had expanded even farther, with confirmed nesting as far north as Aitkin County and as far west as Brown County. It was a common species south of a line that stretched from central Pine County in the east, west to southern Todd, Otter Tail, and Traverse Counties. Since 1970, nesting had been confirmed in a total of 12 counties, largely in the eastern half of the state. By 1998 Hertzel and Janssen added another 3 counties to the list, all in southeastern and south-central Minnesota. Beginning in the late 1980s, the Minnesota Biological Survey documented breeding season observations as far north as Itasca, Beltrami, and Clearwater Counties (Minnesota Department of Natural Resources 2015). The species was absent, however, from the Arrowhead region east of Duluth. Because the Red-bellied Woodpecker is a common visitor to bird feeders, Project Feeder Watch, led by the Cornell Lab of Ornithology, provided additional documentation of the species’ expansion northward. During the project’s first winter (1988-1989) the species was reported at feeders in southeastern and southwestern Minnesota, north nearly to Grand Rapids in the eastern region. By the 2013-2014 winter season they were reported north as far as Duluth, Bemidji, and Moorhead (Cornell Lab of Ornithology 2015). Some researchers have suggested that the increase in bird feeding has contributed to the species’ northern expansion (Shackelford et al. 2000). During the MNBBA, observers reported a total of 1,649 Red-bellied Woodpecker records in 21.8% (1,034/4,748) of the surveyed atlas blocks and in 29.4% (687/2,337) of the priority blocks. Breeding evidence was confirmed in 3.1% (146) of the surveyed blocks (Figures 2 and 3; Table 1). Birds were observed in 80 of Minnesota’s 87 counties, and breeding evidence was gathered in 49 counties (one block straddled Redwood and Renville Counties); 35 of the counties were additions to the list published by Hertzel and Janssen in 1998. The species was most common in the Eastern Broadleaf Forest Province. Although it was encountered frequently in the southern portion of the Laurentian Mixed Forest Province, from the Brainerd Lakes region north to Bemidji, it was absent from most of north-central and northeastern Minnesota. It was equally scarce in the Tallgrass Aspen Parklands Province and in Red River valley. The predicted distribution map generated from MNBBA data (Figure 4) predicts that moderate breeding densities occur throughout the dissected river valleys of the Mississippi River and its tributaries in southeastern Minnesota as well as throughout scattered portions of east-central Minnesota west to the Hardwood Hills subsection in west-central Minnesota. The Blue Earth River and its tributaries in south-central Minnesota as well as the entire Minnesota River valley also support moderate breeding densities. Northeastern, north-central, and portions of northwestern Minnesota support the lowest densities of breeding birds. Given that MNBBA breeding evidence was gathered as far north as Itasca, southern Beltrami, Hubbard, and Cass Counties, Roberts (1932) prediction nearly 100 years ago that the species would continue its spread to the north and west has come true. Indeed, the species’ breeding range has expanded approximately 350 km to the northwest from 1926, when it nested in Minneapolis, to 2013, when it was reported nesting in Bemidji during the MNBBA. The range expansion witnessed in Minnesota is similar to that observed elsewhere along the periphery of the species’ range, including in Wisconsin (Cutright et al. 2006), Michigan (Chartier et al. 2013), Ohio (Rodewald et al. 2016), Ontario (Cadman et al. 2007), and Manitoba (Bird Studies Canada 2017). Farther east, in New England, its northward expansion has been facilitated by an aging forest landscape; farther west, in the Great Plains, its expansion has been facilitated by wooded floodplains and maturing tree plantings in urban areas (Shackelford et al. 2000). Breeding distribution of the Red-bellied Woodpecker in Minnesota based on the Breeding Bird Atlas (2009 – 2013). Summary statistics of observations by breeding status category for the Red-bellied Woodpecker in Minnesota based on all blocks (each 5 km x 5 km) surveyed during the Breeding Bird Atlas (2009-2013). Summary statistics for the Red-bellied Woodpecker observations by breeding status category for all blocks and priority blocks (each 5 km x 5 km) surveyed during the Minnesota Breeding Bird Atlas (2009-2013). Predicted breeding distribution (birds detected per 10-minute point count) of the Red-bellied Woodpecker in Minnesota based on habitat, landscape context, and climate data gathered during the Minnesota Breeding Bird Atlas (2009-2013) using the General Linear Modeling method without an adjustment for detectability. The Red-bellied Woodpecker’s habitat is broadly described as mature hardwood forests that provide trees large enough for cavity excavation (Figure 5). In the southern states, mixed pine-hardwood forests also are used. Although the woodpecker is frequently found in mature floodplain forests, it is equally at home in dry oak and mesic mixed upland forests and readily adapts to smaller woodlots in urban settings. Compared to other woodpeckers, Red-bellied Woodpeckers have been described as being more closely associated with high tree density and with a well-developed understory that has a high density of young trees and shrubs. Larger trees also are favored for nesting cavities (Danz et al. 2007; Short 1982; Shackelford et al. 2000). Data collected during the MNBBA show a strong preference for oak forests (which includes lowland hardwoods), within 200 m of atlas point counts where the species was detected (Figure 6). Typical breeding habitat of the Red-bellied Woodpecker in Minnesota (© Lee A. Pfannmuller). Habitat profile for the Red-bellied Woodpecker based on habitats within 200 m of point counts where the species was present during the Minnesota Breeding Bird Atlas (2009-2013). Data from the federal Breeding Bird Survey (BBS) have been used to generate a 2016 North American population estimate of 15 million Red-bellied Woodpeckers (Rosenberg et al. 2016). In 2013, Minnesota was estimated to support approximately 0.6% of the population (Partners in Flight Science Committee 2013). Applying that estimate to the new 2016 data predicts a statewide population of 90,000 breeding adults. Located on the northwestern periphery of its breeding range in Minnesota, Red-bellied Woodpeckers are considerably more abundant in the southeastern United States (Figure 1). In Minnesota an average of less than 1 bird is observed each year on BBS routes surveyed in the state. This compares with an average of nearly 20 birds per route in Florida, and 18 birds per route in Georgia (Sauer et al. 2017). In the densely forested landscape of northern Minnesota, where the species is uncommon to virtually absent, an average of only 0.06 Red-bellied Woodpeckers were detected on 100 unlimited radius, 10 minute point counts from 1995 to 2010 on the Chippewa National Forest; on the even more densely forested Superior National Forest an average of only 0.03 birds were detected. This compares to an average of 26.08 Yellow-bellied Sapsuckers on 100–10 minute point counts on the Chippewa, and 22.17 sapsuckers on the Superior. The sapsucker is the most common woodpecker in the northern forest region (Niemi et al. 2016). The BBS shows a significant population increase throughout the Red-bellied Woodpecker’s range of 1.02% per year from 1966 to 2015 (Figure 7; Sauer et al. 2017). 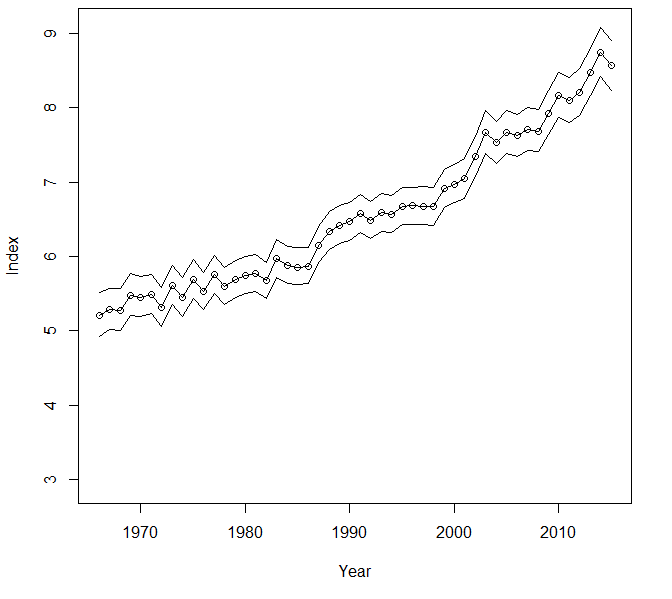 The cumulative increase since 1970 is approximately 63% (Rosenberg et al. 2016). In Minnesota the population is increasing at a much faster pace. Although the species’ relatively low abundance in the state results in a trend line that lacks some precision, it still demonstrates a significant annual increase of 5.87% per year (Sauer et al. 2017). As high as this rate of increase is, it is exceeded by that observed in several northeastern states, including Connecticut (11.50%), New Jersey (6.65%), and New York (8.36%). There is only one region in North America, the Florida peninsula, where the Red-bellied Woodpecker is declining (Figure 8). Breeding population trend for the Red-bellied Woodpecker in North America for 1966-2015 based on the federal Breeding Bird Survey (Sauer et al. 2017). Population trend map for the Red-bellied Woodpecker in North America for 1966–2015 based on the federal Breeding Bird Survey (Sauer et al. 2017). With its rapidly expanding population and its adaptability to a human-modified landscape, the Red-bellied Woodpecker is not considered a conservation priority at the national or statewide scale, nor has it been the focus of targeted conservation efforts or management studies. It has been assigned a relatively low Continental Concern Score of 7/20 (Rosenberg et al. 2016). Its positive response to warming temperatures certainly justifies the assessment that it has a low vulnerability to climate change (North American Bird Conservation Initiative 2010). Forest management practices that protect large trees will benefit the species; as they age, these trees will provide critical nesting cavities. Evans and Conner (1979) noted that to sustain local populations, nest trees need to be 36–53 cm in diameter and 9–15 m in height, and snags should number at least 270 per 40 ha. If forest managers keep these considerations in mind, the Red-bellied Woodpecker will likely continue to increase its presence in Minnesota in the years ahead. Evans, Keith E., and Richard N. Conner. 1979. “Snag Management.” In Workshop Proceedings of the Symposium on Management of Northcentral and Northeastern Forests and Nongame Birds, edited by Richard M. DeGraaf and Keith E. Evans, 214–225. U.S. Department of Agriculture Forest Service General Technical Report NC-51. Kirchman, Jeremy J., and Kathryn J. Schneider. 2014. “Range Expansion and the Breakdown of Bergmann’s Rule in Red-bellied Woodpeckers (Melanerpes carolinus).” Wilson Journal of Ornithology 126: 236–248. Short, Lester L. 1982. Woodpeckers of the World. Greenville: Delaware Museum of Natural History. Wilson, Andrew M., Daniel W. Brauning, and Robert S. Mulvill, eds. 2012. Second Atlas of Breeding Birds in Pennsylvania. University Park: Pennsylvania State University Press.